I've been inspired by chairs that are pieces of art! They might be functional too, but they don't really need to be. They just look great as sculpture. 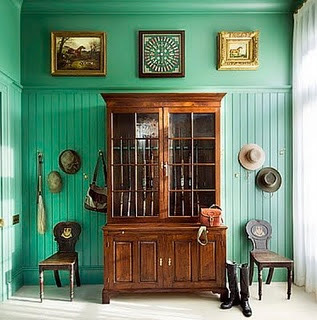 What a fun way to incorporate unique style in to your home, and perhaps a bit of whimsy! The shell chair is the height of whimsy. 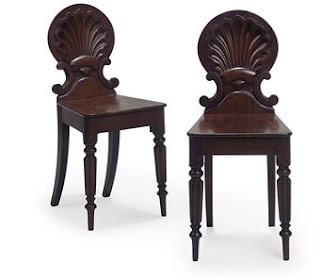 I love these, and am almost certain they're more decoration than seating. But who cares - they're fun! These chairs are more practical - you can sit in them! They bring wonderful decoration to the room with their curved backs, and gold on black chic decoration. And then there's the wonderful hall chair - always meant to be more decorative than functional seating. 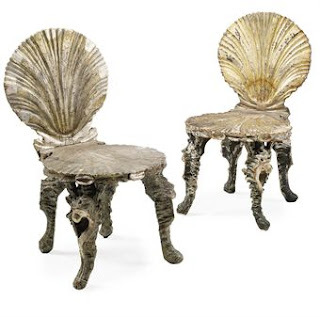 You can find these wonderful 'grotto' chairs at auction. 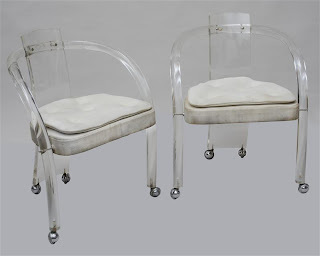 This pair sold at a Christies auction in London. These are Venetian painted and parcel gilt chairs, circa 1900. They sold for $4,900 off an auction estimate of $800 - $1,200. Clearly desirable! 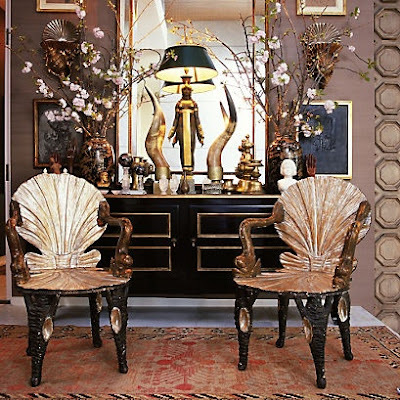 Hall chairs with a shell design are equally decorative. This pair of early Victorian mahogany hall chairs sold at a Chirsties auction for $935, off an auction estimate of $1,500 - $2,000. 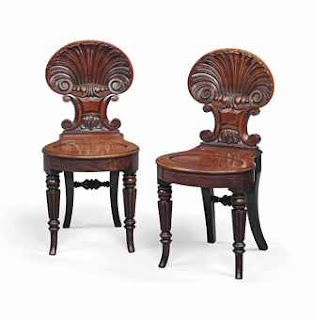 This pair of mahogany hall chairs has an even more detailed carved shell design. These are coming up January 8th at the Christies South Kensington (London) location (Lot 165). They have an auction estimate of $3,200 - $4,900. They are very smart looking! 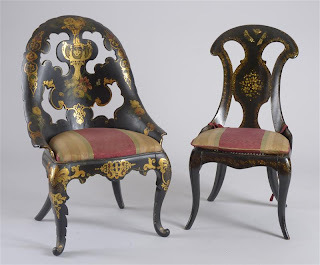 I think these Victorian papier mache chairs are very decorative. I love the shape of the one on the left, and the gold on black decoration of both of them. These were sold at a Stair Galleries auction in Hudson, NY for $325, ff an auction estimate of $250 - $350. Stair Galleries also sold this pair of Regency carved mahogany hall chairs for $1,300, off an auction estimate of $800 - $1,200. Hall chairs are often available at auctions. You just need to do some research, and decide what you want to pay. The more decorative the carving, the more you may need to pay. I thought I include something modern, and fun. 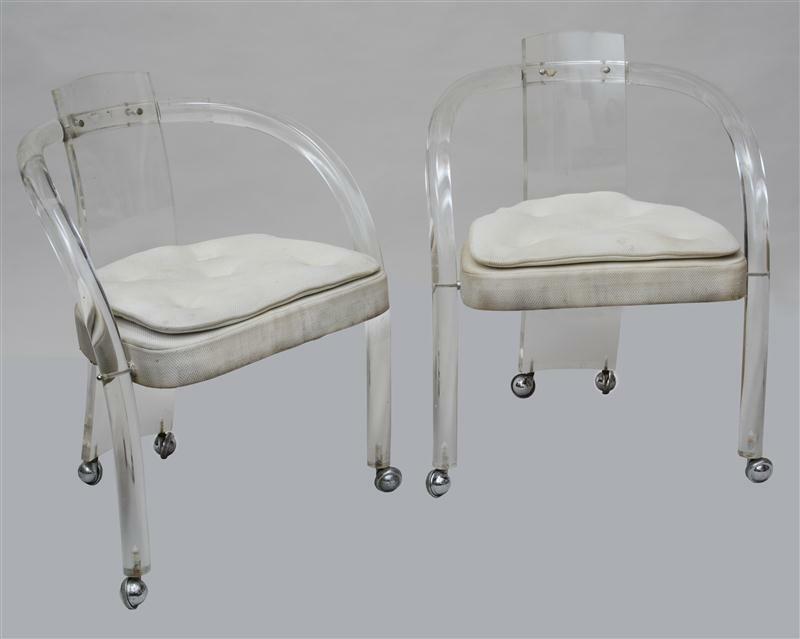 These are 20th century lucite chairs on casters. They have a nice curved shape, and would be wonderful in a small room where you want them to almost fade away. 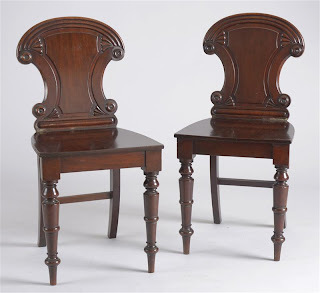 These sold at a Stair auction for $350 off an auction estimate of $300 - $600. We mostly think of chairs as something to sit in, but look around your rooms, and you might find a spot to include a chair that's more sculpture than seating. They can serve as a table substitute, or just something fun to look at!